Enough about food and market posts… let’s explore a little bit more of Seoul! Walking through the busy shopping streets, we were looking for a quieter area to sit down and relax. 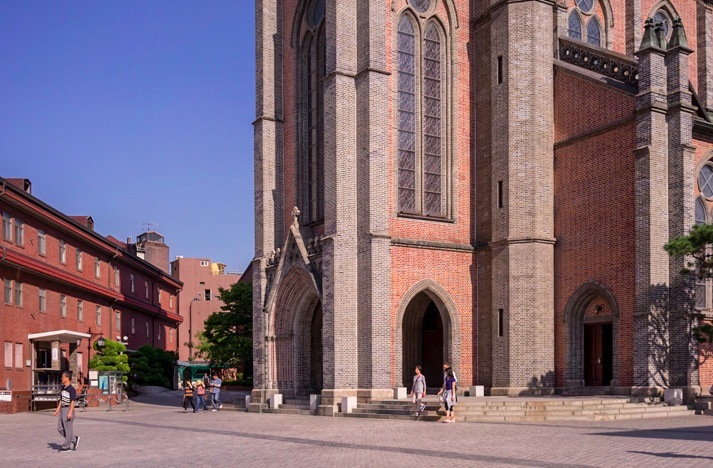 That’s how we came to discover the Myeongdong Cathedral, which is the very first Roman Catholic parish church in Korea. It is also the first Gothic building ever built in Korea. The construction of the cathedral started in 1882 and was completed in 1898. 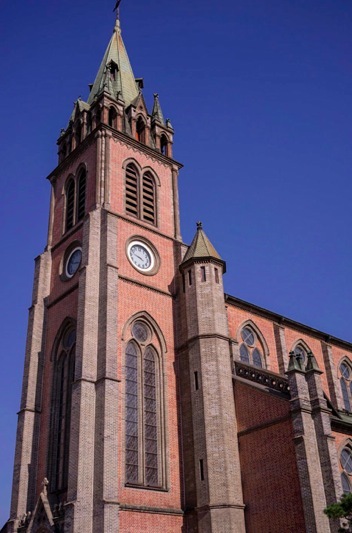 Unlike most Gothic buildings, Myeongdong Cathedral was built with bricks instead of stones. It gives the cathedral a very characteristic atmosphere. We didn’t go inside (it was such a beautiful day) but my guide book said hat the splendid high ceilings inside the church and the arches in between the magnificent inner pillars show the beautiful Gothic style well. 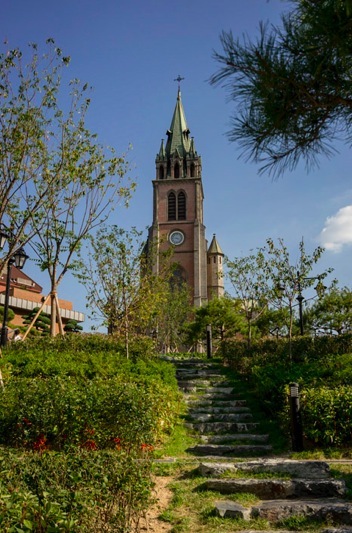 The cathedral is open from 9am to 9pm and it’s address is Myeongdong 2-ga 1, Jung-gu, Seoul-si. The best way to get there is to take the subway to the station with the same name: Myeongdong Subway Station (Seoul Subway Line 4), Exit 8. Then walk along Toegyero-gil street for about 300m and turn right at the intersection. Walk along Myeongdong-gil street for 100m to the Catholic Center.